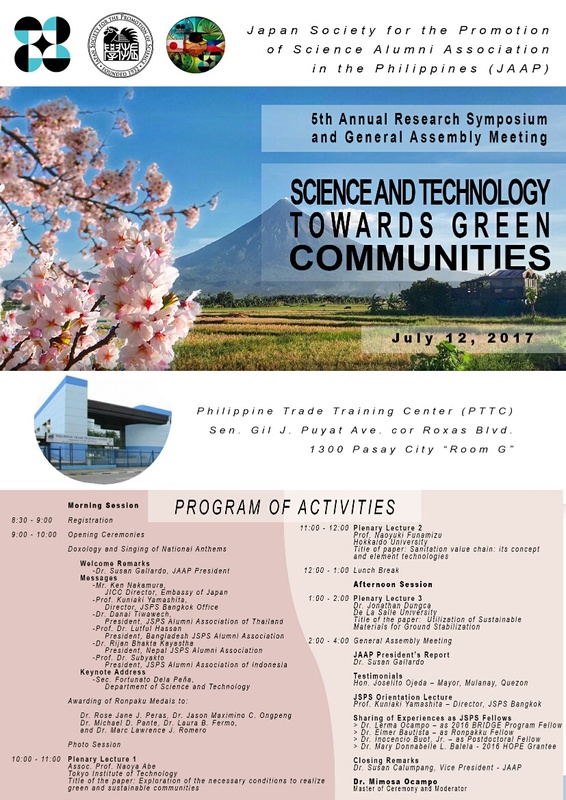 JSPS Alumni Association of the Philippines (JAAP), Inc.
JAAP is recognized as a legitimate alumni organization of Filipino scholars who received grants and fellowships from the Japan Society for the Promotion of Science (JSPS). Its Article of Incorporation was approved on March 4, 2013 with the following officers: Maricar S. Prudente as President, Maria Rowena R. Eguia, Maria Natalia R. Dimaano, Maria Cecilia D. Galvez and Pag-asa D. Gaspillo as incorporators. On March 22, 2013, the incorporators of the association registered it with the Securities and Exchange Commission (SEC) with registration number CN201305277 as a non-stock, non-profit organization.